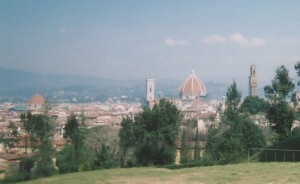 Florence (Firenze) is the regional capital of Tuscany, in the centre of Italy. A town with a turbulent and action-packed history, Florence is now packed with tourists being shepherded around the city's museums. The town is situated on the river Arno, which is spanned by the famous Ponte Vecchio, the only of Florence's bridges not to be blown up in the Second World War. Florence's most striking landmark is Brunelleschi's dome on the Duomo, and its most reproduced sight is Michelangelo's statue of David. In summer, at the height of the tourist season, Florence can be heaving with tourists, as well as uncomfortably hot. But Florence is a tourist city, and its artistic attractions are indoors, so the town is really an all-year-round destination. You're unlikely to find Florence empty; but visiting away from the summer peak should make the infamous queues a little shorter. On arrival, visit the Tourist Information Office opposite the station, where you can pick up a free town plan and a vital piece of equipment - a list of museum opening times and prices. Some museums and galleries are open only in the morning, others may close one or two days a week, so you really need to plan your sightseeing if you want to get the most from your trip. It's also worth visiting the ATAF bus station alongside the railway station to pick up a free bus map and a couple of tickets. Get out of town. If you're in Florence for several days you will probably begin to suffer from the crowds, heat, museum-fatigue. It's a great idea to take a trip out into the Tuscan countryside. Visit one of the Medici villas, explore the hills and vineyards by bus or car, or see another town - Siena or San Gimignano, for example. Reductions at museums: if you are an EU citizen and are over 65, under 25 or a student, you can obtain reductions at some of Florence's sights. Bring your passport and any other ID to confirm your status. See our tourist attractions page for more information. 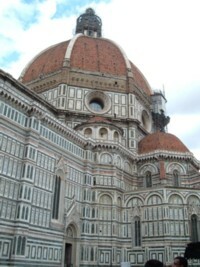 Florence is not a good destination if you are on a budget. There is very little in town for the hard-up tourist. Unlike Rome, where churches and monuments are free of charge, or Venice, where the city itself is the main attraction, Florence will empty your wallet. The Florentines have mastered the art of extracting money from visitors; museums and churches can be very expensive, with few joint/combined tickets on offer. Statues and artworks have been removed from the streets and free churches, and placed in expensive galleries. Of course there is justification for this: tourists swamp the city and it seems fair that the city should profit, but all the same, the constant expenditure is a drain which can leave a nasty taste in the mouth. Tourists may feel especially aggrieved when they find that museums will close down rooms and galleries without advance notice, pleading staff shortages. Prize exhibits may be missing (for restoration or on loan elsewhere), and few museums are well planned and signed. Visitors should research their trip in advance, book ahead or visit at unpopular times, and when you're in a musuem, make a point of exploring stairways and dark corners to make sure you don't miss anything important.